Nourish hard-working hands with Panier des Sens The Absolutes Precious Jasmine Hand Cream, a silky hand treatment formulated with 96% natural original ingredients. 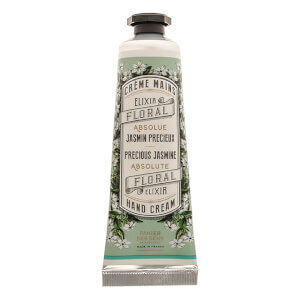 Softening and protective, the hand cream contains Olive Oil to keep skin feeling soft and supple. Melting effortlessly in, it delivers a cocoon of velvety softness to nourish and pamper. Aqua (Water), Glycerin, Hydrogenated Starch Hydrolysate, Olea Europaea (Olive) Fruit Oil, Cetearyl Alcohol, Glyceryl Stearate, Dicaprylyl Ether, Cetyl Lactate, Peg-100 Stearate, Parfum (Fragrance), Acrylates / C10-30 Alkyl Acrylate Crosspolymer, Prunus Amygdalus Dulcis (Sweet Almond) Oil, Levulinic Acid, Sodium Benzoate, Sodium Levulinate, Ammonium Acryloyldimethyltaurate/VP Copolymer, Tocopheryl Acetate, Sodium Hydroxide, Citric Acid, Tocopherol, Glycine Soja (Soybean) Oil.